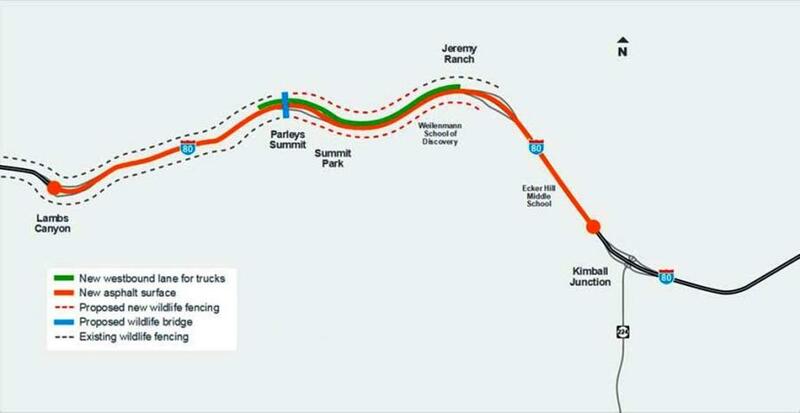 The Utah Department of Transportation (UDOT) began construction on I-80 west of Park City on April 2. Crews are building a new westbound truck lane between the Jeremy Ranch and Parleys Summit interchange, installing additional wildlife fencing and building a wildlife crossing over I-80 just west of Parleys Summit. Beginning as early as April 2, drivers are advised to plan ahead for nighttime work and lane restrictions Monday through Thursday, with narrowed, shifted lanes on westbound I-80. After two weeks, crews will work during daytime hours for the majority of the project, with overnight impacts as needed. Width restrictions also will be placed on trucks traveling westbound through the project limits. These restrictions are scheduled to remain in place 24 hours a day, seven days a week, through fall 2018. This work is part of Renovate I-80, a UDOT initiative designed to maintain and improve one of the most heavily used highways in Utah. Construction schedules are weather dependent and subject to change. For more information, visit udot.utah.gov.